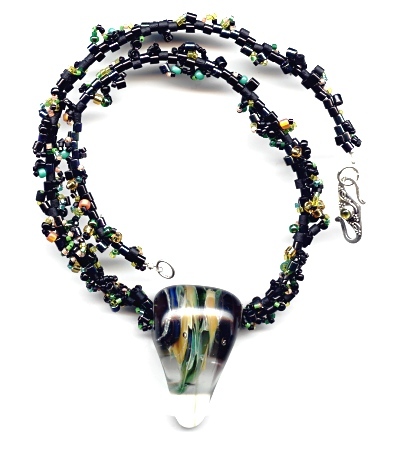 This necklace was beaded for the article ‘Using focal beads’ which appeared in the March 2004 issue of the Beadworkers Guild journal. The article was concerned with coming up with different ideas for using focal beads. This can sometimes be a challenge, one that my Wire and Bead Centrepieces series also addressed. I wanted to showcase the large, dark, lampwork bead but not overpower it. The focal bead used in the piece was strung on flexible beading wire with large seed and cylinder beads. Once strung, I then embellished the strand adding colours that reflected those in the focal bead. This necklace has now been sold.